This is the best video we&apos;ve ever seen. 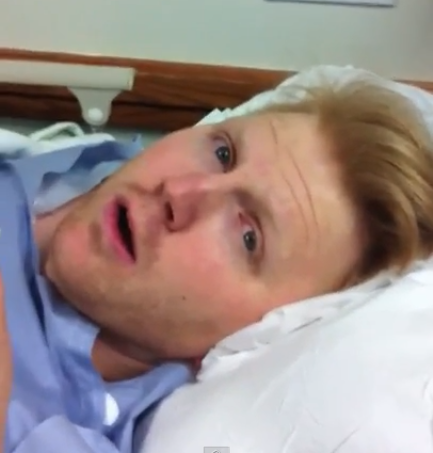 Jason Mortensen has just woken up after a hernia operation. He has temporary amnesia. His wife Candice is by his side filming him with her mobile phone. It&apos;s the fifth time Jason has had surgery while they have been together so she knows enough about previous experiences to make sure to record him this time. Jason has no idea the beautiful woman standing next to him is his wife. He asks, "Did the doctor send you? Man, you are eye candy." "You may be the prettiest woman I&apos;ve ever seen. Are you a model?" She then tells him who she is by saying, "My name is Candice. I&apos;m your wife." "You&apos;re my wife? Holy sh**. Oh my god, I hit the jackpot." Jason can&apos;t remember the incident but later said, "She is the love of my life." What would your partner say if they woke up with amnesia and saw you for the first time?